Are you or your organization interested in partnering with Great Lakes Music Camp? See how you can become part of this lakeshore music experience, and how your support can benefit the students, communities non-profits, and fans of this traditional music collective. 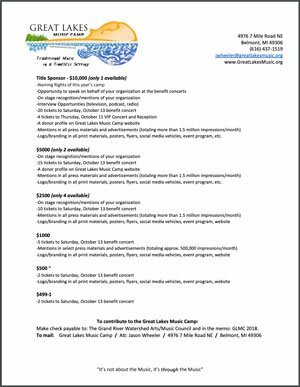 The Great Lakes Music Camp (GLMC) is a three-day acoustic music symposium held during October 11-14, 2018 at Camp Blodgett in West Olive Michigan. World-renown music instructors will offer courses, demonstrations, performances and hosted workshops in the name of traditional music education. The GLMC Executive Director, Jason Wheeler, has solidified a fiduciary/partner in the Grand River Watershed Arts/Music Council (GRWAMC) (501c3) for this year’s camp and we are actively seeking sponsorship for this event. Your contribution is vital to the success of this camp and the perpetuation of this program. Proceeds from these efforts are contributed to The GRWAMC, Camp Blodgett (501c3) and other carefully selected nonprofits in West Michigan. We use music as a tool to pass on traditions and honor the generations before. We use it as a way to communicate and educate. The GLMC does this in the form of workshops and lessons during the three-day camp. We engage the public through benefit concerts. The GLMC steps in where our public school music programs leave off due to recent budget cuts for music programs. Our goal is to raise money for local watershed clean-up activities, programs, and events in West Michigan throughout the year that enrich our community. We need community support in the form of monetary contributions so we can perpetuate the mission of The Great Lakes Music Camp and support the noble efforts of the GRWAMC, Camp Blodgett, and our other nonprofit partners. Camp Blodgett provides children with educational and recreational experiences that promote social responsibility, encourage academic success and support self-esteem development through various activities. Camp Blodgett, founded in 1921, has made it an organizational mission to provide an enriching and safe summer camp experience for all kids in Kent & Ottawa Counties. They offer free school-year programs and host several educational and community-centric events at their beautiful location on shore of Lake Michigan in Port Sheldon, MI. The GRWAMC is a West-Michigan nonprofit dedicated to addressing local water quality issues with action and community engagement. The organization utilizes traditional arts, music, and forums on water quality issues to garner support in the community for its mission. The GRWAMC highlights its efforts through a free, all ages music festival each year that raises funds to support programs and events related to water quality and the preservation of our environment through watershed education. This year’s annual 2018 Grand River Water Festival will take place on Saturday, June 23 at Riverside Park in Grand Rapids, MI. We respectfully ask that you consider a tax-deductible contribution to The Great Lakes Music Camp. We will do everything in our power to demonstrate value and purpose with your generous gift.